We’re lucky to have such a diverse selection of towns and villages in Suffolk to explore, experience and live in. Here are 9 must-see streets to consider for your next journey round the county. Nearly every street in this medieval village is brimming with wonky historical buildings preserved as well as anywhere else in the country. Out of all of them, however, Lady Street best encapsulates what the place is all about. As you wander up its gentle incline you can enjoy the stunning woodwork of the renowned 15th century Swan Hotel and colourful fronts of a number of quaint homes with varying wooden and brick designs. The short street ends in the Market Square, home to the Little Hall, several shops and the most unusual hedge-circled cottage you’re ever likely to see. As you stand at the bottom of Church Hill you are treated to one of Suffolk’s finest village vistas: at your feet The Splash – a small ford – washes over the cobbled road while the imposing St Mary’s Church looks down over the village’s collection of beautiful homes and cottages. Just behind you will be the Bell Inn, the village’s local and spot where Kersey residents will be incredibly happy to tell you more about the area’s connection to the cloth industry or offer advice on the best walking track for a ramble through the countryside. Running adjacent to the town’s historical abbey and its beautiful gardens, from the road you can view much of the monastery’s 14th century remains including the Great Gate, Norman Tower and its walls. More modern attractions include the ivy-clad Angel Hotel and the Grade II listed Pillar of Salt roadsign – Britain’s first illuminated sign of its type. Near to where it connects with Mustow Street, park up and sample some of Bury’s best restaurants. At the height of summer this coastal town is adorned in brightly-coloured bunting, giving it the retro feel of a classic seaside getaway. The Market Place is often the hub of activity and just off it is East Street, a narrow yet direct route to the beach. As you walk past restaurants, pubs and beautifully-painted terraced houses, the sounds, smells and sights of the sea will gradually become more tangible and you’ll really feel like you’re on holiday. Follow the sounds of the sea a couple of roads down from the bustling High Street and you’ll find the Crag Path. Right on Aldeburgh Beach, it’s home to a number of terraced houses, all of which fetch a pretty penny and have breathtaking panoramas of the Suffolk Heritage Coast. It’s also a cracking spot to start your exploration of Benjamin Britten’s former home: with a battered haddock in hand from Aldeburgh Fish & Chip Shop, go one way and you’ll find the 16th century Moot Hall and The Scallop sculpture. At the other end you’ll discover an RNLI station, quaint independent stalls and a Napoleonic-era Martello tower – do you really need anything else to do? Glencairn Stuart Ogilvie designed all of Thorpeness to feel like a whimsical version of England from generations past and The Sanctuary perhaps epitomises the feel that he meticulously strived to create. Every building has been designed to look as though they’re from the Tudor and Jacobean period yet they were actually built less than a century ago, creating an unreal, fantastical feeling to the coastal location. As you go down the unpaved road, you’ll pass wood-clad and timber housing, wonderfully maintained lawn tennis courts and numerous other eccentricities. After going up through Bridge Street and Market Hill you’ll reach this narrow street in the East Suffolk market town. Lining the slight incline are several restaurants and the beautiful tree-filled grounds of the 14th century Church of St Michael. This will then lead you straight into the town’s main attraction, Framlingham Castle. After a few hours exploring the castle, head back down Church Street to where it opens into Market Hill and its surrounding square of distinctively designed shops, pubs and eateries. Visitors will likely come for the unusually complete Orford Castle, but for a taste of what life would be like living in the Suffolk countryside, visit this street adjacent to Saint Bartholomew’s Church. Inhabitants of the street’s ivy-clad red-brick cottages get views over the church’s grounds while majestic willow trees emerge from their gardens and loom over the road. This theme carries on into the equally beautiful yet even narrower Doctor’s Lane where you won’t want to meet oncoming traffic. As you arrive from Bungay on the B1062, take a left at Beccles’ iconic town sign onto Ballygate, a direct line into the heart of this market town. Terraced housing watches you from either side of this busy thoroughfare that ends in the New Market area of town. At first, Beccles Bell Tower will be hidden by the enclosing homes but it gradually emerges once you’ve had a quick look at a small part of the River Waveney down to your left. 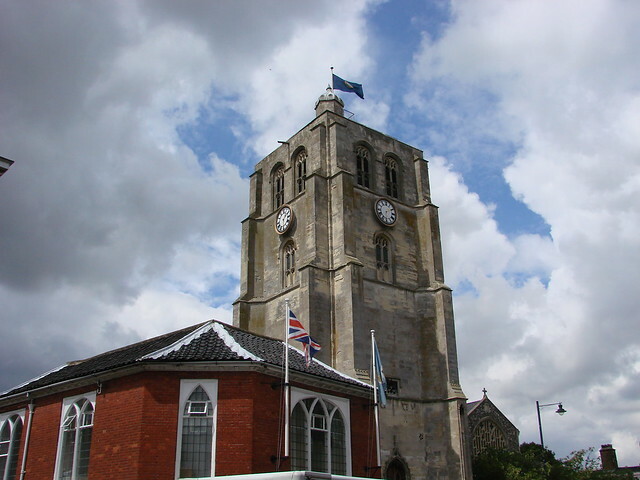 For even more examples of Beccles’ typical 17th and 18th century architecture, go beyond the Bell Tower to Northgate.